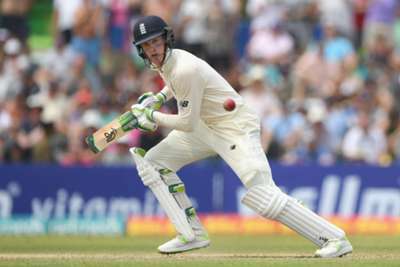 Keaton Jennings was delighted to return to form with a century against Sri Lanka, admitting his performances earlier in the year were not good enough. The England opener – under added pressure following Alastair Cook's retirement – hit an unbeaten 146 on Thursday as the tourists declared on 322-6 to set Sri Lanka a huge target of 462 in the first Test. But Jennings, although delighted with his display, is now determined to deliver on a more consistent basis, having ignored the criticism that came his way as he struggled alongside Cook in previous series. "I suppose all you can do is try to score runs when you get the opportunity," he told Sky Sports after just his second Test century, following a debut ton against India in 2016. "At the end of the day, the summer was tough, and performances weren't up to scratch, I'm happy to admit that. Hopefully, now I can keep putting in performances that put us into match-winning positions. "I did [read criticism] a year ago and think I got myself into quite a state reading that, waking up in the middle of the night stressing about it. But no, not anymore. "I just let myself listen to a core group of people who have stuck with me for the last 25 or 26 years. "It's been a very special day for me personally and it's special to be in such a good position in this Test match, hopefully we can go on and win it. "It was about taking the risks at the right time, it felt like there was a ball in there that could get you out, so it was that cat and mouse game again, trying to get off strike, trying to put pressure on the bowler in order to get that bad ball."